So, the 2nd Media Production Show has been and gone. Hands up who went to Islington by mistake? I know at least two people who did. Their secret is safe with me! For me, the sign of a great trade show is when I come away really enthused about an innovative use of existing technology or a brand new product. When I find something that combines both these things, then I'm a very happy man. I'm pretty sure I've never seen a shipping container exhibited at a broadcast trade show before. 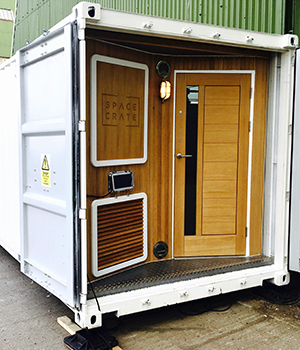 But some very imaginative and talented audio guys have developed SpaceCrate; a totally portable and adaptable production facility. From the outside it looks like a typical shipping container but step inside, and you find yourself in a surprisingly large, acoustically perfect, beautifully lit, air-conditioned flexible creative workspace. This brand new creation was heading straight off from the Media Production Show to its first paying job on a film set (see photo below). I hadn't realised that most, if not all, feature film dialogue has to be re-recorded in post, sometimes months after the actual filming has finished, so that the audio can be completely controlled and is clean of the inevitable background noise on set. Automated dialogue replacement (ADR) is hugely expensive, and one use of the Spacecrate is as a temporary ADR facility on set, so the actors can re-record their lines straight after filming their scenes. So, no expensive call backs, and very likely a better performance from the actors, who are still 'in character'¦it's a win/win! The SpaceCrate can also be configured as an overflow edit suite, a green screen filming environment, or even a temporary studio. It's highly adaptable, well designed and easily transported. What's not to like? The show seems to have been well received by most and although it's still establishing itself in the trade show calendar, it does seem to have gained a lot of traction quite quickly. Post-production was well-represented with the major resellers all present and showing off their wares. But for me the star of the show was the EVA1 camera. Panasonic were not even showing a working model, but from the spec alone, it seems to have made quite an impact. My sources tell me that delivery is around IBC time, and the major dealers have all committed to decent numbers so they must be pretty confident that it will be popular. As one told me at the show " it's 4:2:2, it's 10 bit¦it's telly. It'll sell ". The EVA is a lot more than that too, and it's a long time since Panasonic has had such a potential success story on its hands in the Broadcast sector. They have a 70% global share of PTZ sales, but the UK broadcast market has been tough for them for years, so it'll be interesting to see how this one pans out. Canon were also there, working with hire company Shooting Partners to demonstrate their new C200 camera. This is not shipping yet either but the announcement of these two new cameras prompted Sony to announce a camera that won't be shipping til next year. Watch this space for more details. In other news, IDT have been making great strides with their super slo-mo camera. Slow motion filming is becoming ever more popular in sports programming as well as mainstream TV productions. Those of a pedantic nature might argue that you can't strictly have more than one Unique Selling Point, but if you can, then this product would have three. Its size (it's much smaller than the alternatives), the fact that it can record on to standard COTS (commercial off the shelfl) recording media, and that it's significantly more cost-effective than the competitors. IDT have done really well selling their cameras into car safety research establishments recently... crash test dummies have never looked so good. They have made a number of modifications to make their cameras more "media industry" friendly, and I think this year could prove to be a good one for them if a recent test shoot at Rockingham race track is anything to go by. Their O10 model can record 4K at an astonishing 1000 frames per second. In the OB world there still seems to be a disconnect between what the manufacturers are saying about IP adoption and its current functionality, and what the OB businesses themselves are saying about the same issues. Whilst the manufacturers are adamant that IP is truck-ready and will be less expensive due to the COTS router technology and reduced wiring requirement, the truck owners are yet to be convinced. At a recent London tech event SAM made the pertinent point that it took several years to make the relatively straightforward transition from SD to HD. Yet right now, we are trying to introduce 4K, HDR, HFR and the manage technical shift from base band video to IP workflows. It's a hell of a time to be in our industry. I'm often told that broadcast and IT are merging. But the broadcast market globally is still smaller than the global market for printer ink. Of course, that stat may just have been made up, as 67% of stats tend to be. In conclusion, business seems generally pretty buoyant which is certainly good news for the newest media finance company on the block. We're extremely grateful for all the messages wishing Adamantean well, and look forward to helping you find the best way to finance your new purchases.